Television is one of the best ways for entertainment and it has become very much important nowadays. In fact, Television has become an integral part of our lives. Well, there are many services in the market like Netflix, Hulu, Amazon Prime, etc. that provides almost all movies and TV shows. However, we cannot deny the importance of Television these days. At the same, our work schedules have become so tight that doesn’t let us sit in front of the TV and wait for the favorite movie or TV show to go on air. But, now you can Watch Live TV on your computer or laptop by putting a few minutes of effort. There’s a popular media player called Kodi, millions of people are using it all over the world. In this article, we’re going to help you with the Best Live TV Addons for Kodi 2018. If you’re a Kodi user, then use these Addons to watch Live TV from anywhere in the world. One thing I would like to say, use a VPN whenever you stream a show or a movie to stay out of legal/copyright troubles. These Kodi live tv addons will help you in streaming any movie or show that is airing on the Television. 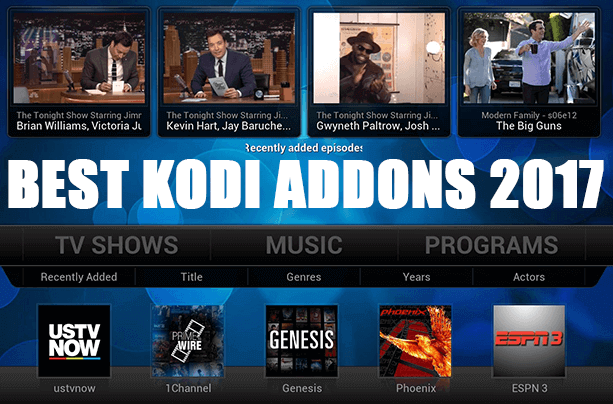 So, without wasting any further time, let’s hop on the list of Best Live TV Addons for Kodi. GoodFellas is one of the best third party Kodi addon that lets you stream live TV channels. It comes with almost all the major premium channels such as Sky Sports, ESPN etc. You can watch almost anything with the help of Goodfellas. Right from Entertainment to Documentaries, Goodfellas has got everything you need. Go ahead, give it a try. It’s free to download, so there’s nothing to lose in trying. USTVNOW Plus isn’t a free addon for Kodi. You have to pay 19$ to get the subscription of one month. Well, being a paid addon, your expectations go high as sky. Surprisingly, it has got almost all the American channels for watching TV shows, comedies, action, movies and much more. With just 19$, you stay entertained all the time, it’s worth trying out. iPlayer addon for Kodi is known as BBC player as it’s a product of BBC. iPlayer brings the most popular radio streaming channels for Kodi users. The addon can provide you personalized recommendations based on your interests. Apart from that, you can track your favorite shows and watch them anywhere you want within next 30 days. Overall, BBC Player is good enough to consider as one of the best Live TV Addons for Kodi Media Player. Halow Live TV is known for its large network of TV channels. It features almost all the major country channels. Whatever your interests are, be it sports or action-packed movies, Halow Live TV has got your back. However, you need to have a VPN running in order to watch Live TV for an uninterrupted experience. Halow Live TV is available for Android as well IOS platform. Go ahead and give it a try, I’m sure you won’t be disappointed with its features and performance. UKTV Now is one of the best live TV addons for Kodi users. It lets you stream all types of channels from over 10 major countries. It works really well if you have a good internet connectivity, the streaming quality is acceptable at this point. So, don’t wait and install the addon right away to enjoy the Live TV watching. Setting up the addon needs some effort but it’s totally worth. cCloud TV was actually built for the community of Kodi. It is a cloud-based addon that provides Internet Protocol television (IPTV) service. Well, this isn’t actually a Live TV streaming service. The way of working of this addon is quite similar to how Torrents work (One user uploads the content, other one downloads it) The community uploads almost all the good stuff like Movies, Shows, Drama, Comedies etc. The name itself sounds quite sensational. Rising Tides is comparatively a new Live TV streaming addon in the market. The addon features over 27859 channel presets, it ensures that you never run out of entertainment. You can also watch highlight of popular sports like Soccer, Cricket etc. There are a lot of features that are yet to come in this addon. As of now, it’s perfect enough to satisfy your need of having Live TV feature. Quantum is another popular live TV addon for Kodi, formerly known as Sanctuary. It provides all type of channels to watch such as kids, entertainment, documentaries, Action, drama, serials, reality shows and much more. There are quite a lot of channel bundles inside Quantum, you’ll have a good time with this live TV addon. The installation process of Addon is also quite simple and doesn’t take much time to get it done. If you are looking for a live TV addon that is based on UK and US, then Oblivion Streams is a perfect fit for you. It’s an IPTV service that provides all the major channels from UK and US. In case, if you like Music and Radio stuff, Oblivion Streams has got that as well. It’s a one-stop destination for all of your entertainment needs. It doesn’t take much longer than 1 minute to setup the addon for your Kodi Media Player. StreamZ TV is another well-known addon that is being used by millions of people all over the world. This one is heavily focused on Live IPTV. Well, the streaming quality isn’t really great, but it’s a good enough to understand the content. The additional features of this addon compensate the streaming quality. The addon comes with two types of channels, the popular channels are paid, whereas the common channels can be watched for free of cost. You can expect constant updates from this addon because of this growing popularity. Try them out today and make way for watching Live Tv channels on Kodr right away. Show your love by sharing this guide with your friends on social media like facebook, twitter, google plus, etc. Feel free to share your thoughts on this article using the comment box. Thank you so much.